From the late 1820s to the 1870s, an estimated 300,000 fur traders, missionaries, settlers, and gold seekers followed these trails. In the 1840s and 1850s, emigrants from the eastern and central United States walked 2,000 miles from the Missouri River landings to fertile Oregon farmlands or California goldfields. Once-friendly western tribes watched in mounting anger as emigrants impacted the game, grass, water and wood. The rich and varied cultures of the Great Plains Indians were changed forever. The Oregon and California trails had significant roles in the history of the United States, and were designated by Congress as national historic trails. The National Park Service partners with site owners to preserve the trail and to develop opportunities for visitor use and enjoyment. and California National Historic Trails' official logos, as well as signing for the Auto Tour Route. This automobile tour route parallels the trails via modern highways and provides directional signing to trail sites. An Oregon Trail village from 1848-1859. The 83-acre park preserves an Oregon Trail trace, pioneer graves, and restored bluestem prairie and native woodlands. This site was an important stopping point for trail emigrants. 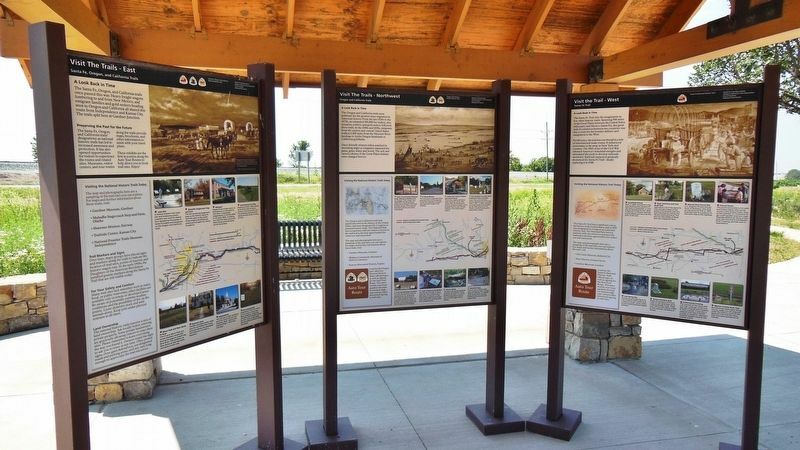 Across the highway is a public rest stop with Oregon Trail exhibits. This Indian Agency served to meet the terms of the 1861 Treaty with the Potawatomi Indians. Emigrant wagon trains stopped here to rest, change livestock, and make wagon repairs. Louis Vieux, a Potawatomi Indian, established a toll bridge here in 1847. In 1849, members of a large wagon train camped by the creek were struck by cholera, leaving 50 emigrants dead within a week. This site was another favorite campground for emigrants. Although the spring itself is on private property, there is a roadside pullout just south of the site, and a public park with trail sculptures and displays. This site was thought to be an alternate river crossing used in later years of the trail. 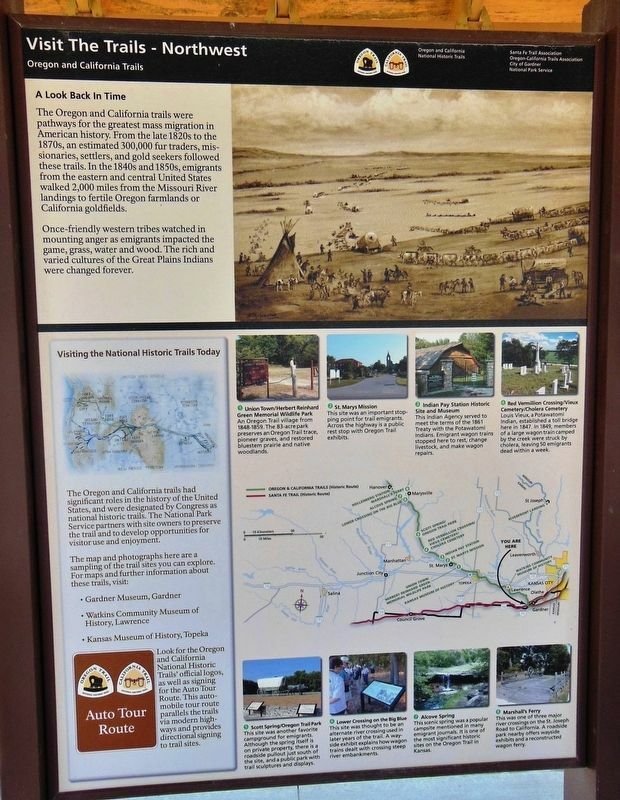 A wayside exhibit explains how wagon trains dealt with crossing steep river embankments. This scenic spring was a popular campsite mentioned in many emigrant journals. It is one of the most significant historic sites on the Oregon Trail in Kansas. This was one of three major river crossings on the St. Joseph Road to California. A roadside park nearby offers wayside exhibits and a reconstructed wagon ferry. Marker series. This marker is included in the California Trail, and the Oregon Trail marker series. Location. 38° 47.786′ N, 94° 57.702′ W. Marker is in Gardner, Kansas, in Johnson County. Marker can be reached from the intersection of U.S. 56 and West 183rd Street, on the right when traveling west. Touch for map. This marker is the center panel of a three-panel marker kiosk near the parking lot at Gardner Junction Park. Marker is at or near this postal address: 32505 West 183rd Street, Gardner KS 66030, United States of America. Touch for directions. (here, next to this marker); a different marker also named A Look Back in Time (here, next to this marker); Eye of the Needle (within shouting distance of this marker); Following Their Dreams (within shouting distance of this marker); Apprehension and Conflict (within shouting distance of this marker); From Prairie Schooners to Locomotives (within shouting distance of this marker); Overland Trails (approx. 1.9 miles away); The Herman B. Foster Home (approx. 1.9 miles away). Touch for a list and map of all markers in Gardner. Credits. This page was last revised on March 24, 2019. This page originally submitted on March 24, 2019, by Cosmos Mariner of Cape Canaveral, Florida. This page has been viewed 55 times since then. Photos: 1, 2, 3, 4. submitted on March 24, 2019, by Cosmos Mariner of Cape Canaveral, Florida.